Rheumatoid arthritis (RA) is a chronic inflammatory disease characterised by joint swelling, joint tenderness and destruction of synovial joints, leading to severe disability and premature mortality. Given the presence of autoantibodies, such as rheumatoid factor (RF) and anti-citrullinated protein antibody (ACPA) (tested as anti-cyclic citrullinated peptide), which can precede the clinical manifestation of RA by many years, RA is considered an autoimmune disease. Autoimmunity and the overall systemic and articular inflammatory load drive the destructive progression of the disease. However, although structural changes, which can be visualised by conventional radiography or other imaging techniques, best distinguish RA from other arthritic disorders, joint damage is rarely apparent in the very early stages of disease, but rather accumulates consistently over time. Rheumatoid arthritis is a disorder that typically affects the small joints in your hands and feet. Unlike the wear-and-tear damage of osteoarthritis, rheumatoid arthritis affects the lining of your joints, causing a painful swelling that can eventually result in bone erosion and joint deformity. It can feel a little bit like the flu, but these symptoms are usually less intense and last longer. In a few people with RA — less than 5% — the disease makes their eyes red, painful, or dry. Over the last decade, the optimal use of disease-modifying antirheumatic drugs (DMARD), in particular the anchor DMARD methotrexate, and the availability of new biological agents, have dramatically enhanced the success of RA management. Moreover, it has been recognised that early therapeutic intervention improves clinical outcomes and reduces the accrual of joint damage and disability. 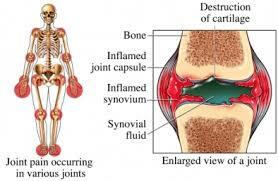 Undoubtedly, treating patients at a stage at which evolution of joint destruction can still be prevented would be ideal. However, at present, clinical trials of RA treatments are hampered by lack of criteria allowing for study enrolment of patients at early stages of disease. Thus, to date it has not been possible effectively to investigate the efficacy of early interventions in terms of their ability to prevent later-stage RA, since there are no validated or accepted uniform criteria to classify such individuals with early disease. Lung disease. People with rheumatoid arthritis have an increased risk of inflammation and scarring of the lung tissues, which can lead to progressive shortness of breath. There’s a chance you could feel chest pain, which you should call your doctor about. Disease-modifying antirheumatic drugs (DMARDs). These drugs can slow the progression of rheumatoid arthritis and save the joints and other tissues from permanent damage. Common DMARDs include methotrexate (Trexall), leflunomide (Arava), hydroxychloroquine (Plaquenil) and sulfasalazine (Azulfidine).Side effects vary but may include liver damage, bone marrow suppression and severe lung infections. Biologic agents. Also known as biologic response modifiers, this newer class of DMARDs includes abatacept (Orencia), adalimumab (Humira), anakinra (Kineret), certolizumab (Cimzia), etanercept (Enbrel), golimumab (Simponi), infliximab (Remicade), rituximab (Rituxan) and tocilizumab (Actemra). Tofacitinib (Xeljanz), a new, synthetic DMARD, is also available in the U.S.These drugs can target parts of the immune system that trigger inflammation that causes joint and tissue damage. These types of drugs also increase the risk of infections.Biologic DMARDs are usually most effective when paired with a nonbiologic DMARD, such as methotrexate.